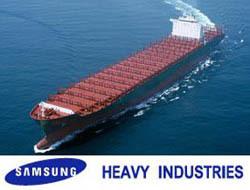 Samsung Heavy Industries discuss with Israel Corp unit Zim Integrated Shipping Services possible delays to ship orders totaling $1.4 billion. Samsung Heavy Industries said on Friday it would discuss with Israel Corp unit Zim Integrated Shipping Services possible delays to ship orders totaling $1.4 billion. A spokesman at South Korea-based Samsung, the world's No. 2 shipbuilder, said Zim officials would visit next week to discuss delivery delays. Samsung shares fell 10.2 percent to 22,000 won by 0557 GMT, underperforming the wider market's 3.49 percent loss.